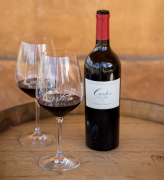 This is the second release of Carter Cellar's Weitz Vineyard Cabernet and we are thrilled about the long term prospects of working with this pedigreed Oakville hillside vineyard. The reddish brown soils are littered with volcanic rocks and the vines bath in the sun from early morning to late in the evening. In the glass, the wine is translucent purple and opens with signature scents of red and black berry fruits, cassis and mocha. Notably plush tannins and natural acidity are coupled with a distinct minerality from the heavy graveled soils. Considerable depth and fruit will develop as the structure starts to integrate with a little bottle age. Decanting a few hours will benefit this wine for early drinking; cellar for 6-12 years to enjoy this wine in its prime. "The 2013 Cabernet Sauvignon Weitz Vineyard has a more earthy nose, an inky, black/purple color, Pauillac-like licorice, graphite and charcoal, beautiful, ripe fruit in the mouth, tremendously generous and opulent, but not the complexity and je ne sais pas quoi that the other cuvées possess. 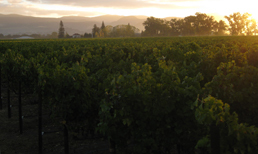 This is still an amazing Cabernet Sauvignon to drink over the next 25 years." 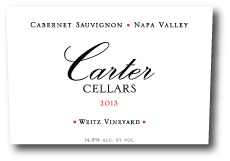 The Carter Cellars 2013 Weitz ' Cabernet has sold out, but other Carter wines are available.